Simon & Schuster, 9781476789330, 272pp. “A clever beach bag must-have” (People) from Laura Dave—the author of the “addictive” (Us Weekly) and critically acclaimed bestseller Eight Hundred Grapes—“a smart, fun read about trying to live an authentic life in the age of social media overload” (PopSugar). Sunshine Mackenzie has it all…until her secrets come to light. Sunshine is living the dream—she’s a culinary star with millions of fans, a line of #1 bestselling cookbooks, and a devoted husband happy to support her every endeavor. Sunshine Mackenzie has it all…until she gets hacked. When Sunshine’s secrets are revealed, her fall from grace is catastrophic. She loses her husband, her show, the fans, and her apartment. She’s forced to return to the childhood home—and the estranged sister—she’s tried hard to forget. But what Sunshine does amid the ashes of her own destruction may well save her life. 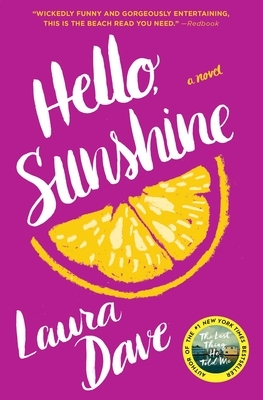 “A delightfully addictive page-turner” (WMagazine.com) that takes place in a world where celebrity is a careful construct, Hello, Sunshine is “wickedly funny and gorgeously entertaining…there is no chance you won’t consume this golden summer read in one sitting” (Redbook.com). Laura Dave is the international bestselling author of Hello, Sunshine, Eight Hundred Grapes, The First Husband, The Divorce Party, and London Is the Best City in America. Her novels have been published in eighteen countries and optioned as major motion pictures. Dave’s writing has appeared in The New York Times, Glamour, Self, Redbook, and Cosmopolitan. She lives in Santa Monica. "Dave reveals her skill at crafting deeply flawed yet sympathetic characters and avoids easy resolutions in favor of realizations hard won by the heroine. The settings—both the glamorous Manhattan and Hamptons environs and the restaurant-kitchen intrigues—are engaging...Sunshine’s journey to define herself apart from her Instagram filters and YouTube followers is where the novel shines." "Dave creates a resilient, likable heroine whom readers can sympathize with and root for...Sunshine's journey is full of warmth, heart, and enough surprising twists to keep the story fresh. This upbeat, engaging exploration of finding one's authentic self is sure to make some of the "Best of Summer" book lists." "A smart, fun read about trying to live an authentic life in the age of social media overload." "Dave's sprightly, effervescent prose style crafts a deeply flawed character who is somehow still lovable and relatable." "Perfect summer reading...For fans of Confessions of a Shopaholic and Something Borrowed." "Hello, Sunshine is scandalous, gossipy, fun to read, and as juicy as that slice of fruit on the cover!... If you were looking for your beach read, this is it."